Terror. Destruction. The muffled cries from thousands of children. A society ripped in half. Would you believe me that all of this is and much more is caused by one terrible organization? Would you believe that this single organization is responsible for thousands of lives, is the ripper of families, and is the maker of violence. This powerful organization is ISIS. ISIS is a world issue that is slowly slipping out of our grasp and will become unconquerable. Yes, Mr./Madam President, America must wage war on ISIS and continue the War of Terror. 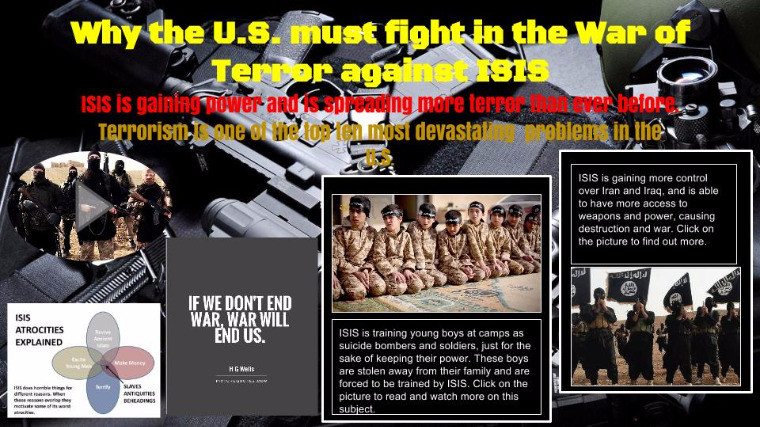 We need to battle ISIS to stop their slaughter of innocent victims and to stop ISIS from reaching their goal. Murdering people without second thoughts or even guilt is what makes ISIS a monster. This abhorrent system massacred many religious minorities such as Christians and Yazidis just to spread their idea of the so called ¨Islamic way¨. ISIS is involved with multiple beheadings of many Iraqi men and even Americans such as James Foley, a journalist who was a correspondent of the Syrian Civil War. ISIS replied to America’s outraged cries by threatening if any more Americans intervene with them, they will have the same fate as James. Don’t you see that ISIS is slowly turning Southwest Asia into a bloodbath? We as American citizens cannot just ignore this fact. This is reality. Mr./Madam President, we have to prevent more deaths from happening or else ISIS will go insane with power, corrupting anything that is in it's way. There have been recent facts that this war is too expensive for our delicate economy to handle and we might end up being poor. But being in poverty is the least of our concern. Asia is being terrorized as we speak and many are dying just because we couldn’t offer our aid. Just like how we fought for independence in the American Revolution, there are ordinary people struggling to fight back against ISIS and want to remove the fear that runs through their country. As American citizens, we should know best about fighting for independence. Even if we suffer from poverty, we should help defeat ISIS before it becomes a world issue and makes everyone endure the same pain. We need to prevent ISIS from establishing their goal, which is to create a unified, Muslim territory in order to enforce their extremist beliefs. We cannot let this happen because it will cause a tyranny in Southwest Asia to spread and will cause global problems such as terrorism and economic dilemmas if this is achieved. Once ISIS has reached this goal, they will create more ambitious plans such as taking over Asia, Europe and eventually, declare war on the United States. By this phase, ISIS’s power will become very difficult to defeat, and we will have a greater chance of surrendering to this demonic organization. This is why we must strike ISIS when it’s still weak. Overall, ISIS must stopped before more murder is committed and before they complete their mission. Americans cannot keep hoping that ISIS is just a bad dream and if they close their eyes, it will go away. If the United States continues this, the world will end up in ruins and true happiness will become harder to seek. The world would become black and white with no real color. Reality is always harsh. Mr./ Madam President, I congratulate you for your stunning victory and hope that you will always do the right thing for this country. You must choose to wage war on ISIS and end all this chaos to create an everlasting peace on this world. By the Time 3 Years Is up That 31,000 Could Be Double, or More! And the Amount of People Suffering with This Is Astonishing. I Would Put My Life on the Line to Ensure That Those People Were Not Longer in Danger and Living in Fear! "Should US Help Iraq Fight ISIS." The Premier Online Debate Website. Web. 04 Nov. 2016. Coll, Steve. "In Search of a Strategy." The New Yorker. 31 Aug. 2014. Web. 04 Nov. 2016. "The Problem With ISIS." RealClearWorld. Web. 04 Nov. 2016. "Jihadica." RSS. Web. 04 Nov. 2016. Drug abuse is really dangerous and happens every day. We can change the life of millions of teenagers finding a way to help them stop doing drugs. Drug abuse has become an issue that has caused many teens and young adults to drop out of school, lose their jobs and sometimes lose their homes.